Viewing 24 of 46 items. Congratulations graduate! You did it. Now it’s time to tell the world with this set of photo graduation invitations. Set of flat photo invitations with fully designed back. Blank white envelopes.. These invitations feature glittered die-cut card stock attached to printed invitations on ivory cards secured with satin ribbons. 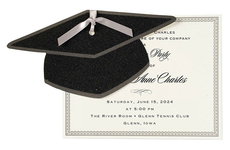 Assembled invitations measure 5" x 8", printed invitations..
Congratulations graduate! You did it. Now it’s time to tell the world with this set of graduation invitations. 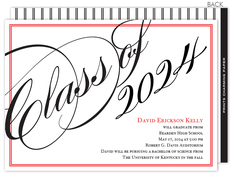 Set of graduation invitations with fully designed back. Blank white envelopes.. 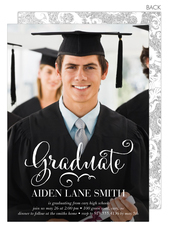 Announce the graduation ceremony or the celebration of the graduation with this stylish photo card. Set of flat photo announcements with blank white envelopes included. You import the photo which will..
Congratulations graduate! You did it. Now it’s time to let family and friends know when the celebration begins. 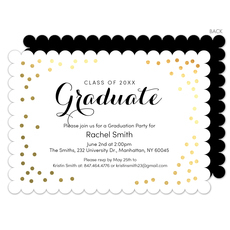 This is a set of flat invitations with a gold foil confetti border and fully..
Congratulations graduate! You did it. Now it’s time to tell the world with this set of graduation invitations. 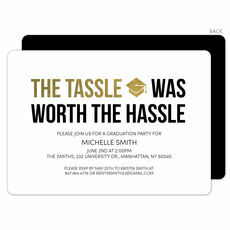 Set of flat invitations with fully designed back. Blank white envelopes included. .. These invitations feature glittered die-cut grad card stock attached to printed invitations on ivory cards secured with grosgrain ribbons. Invitations measure 9" x 3.75". 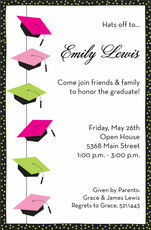 Invitations,..
Congratulations graduate! You did it. Now it’s time to tell the world with this set of graduation invitations. 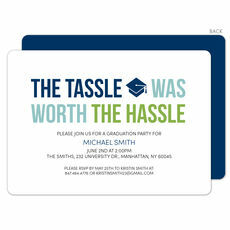 Set of flat invitations with fully designed back. Blank white envelopes included. 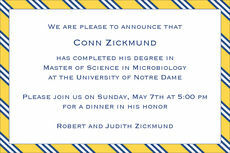 Card..
Congratulations graduate! You did it. Now it’s time to let family and friends know when the celebration begins. 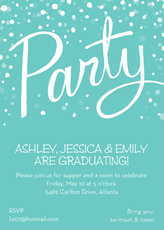 This is a set of flat invitations comes with a fully designed back. Blank white.. 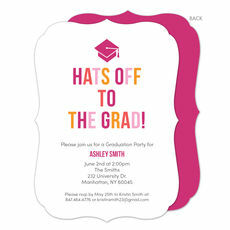 These graduation invitations are the perfect way to announce your party or special event in style. Set of flat invitations with matching blank white envelopes included. Card size is approximately..
Congratulations graduate! You did it. Now it’s time to tell the world with this set of graduation invitations. 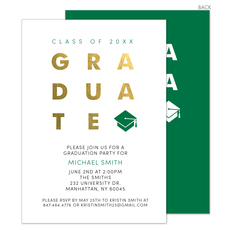 Set of flat graduation invitations with fully designed back. Blank white envelopes.. This invitation is the perfect way to announce your party or special event in style. Personalize with your own special text, and use it for the party or event of your choice. Size is 5" x..
Graduation is a special event and if you are planning a blowout grad party or a simple luncheon for close family and friends, you will want to create a special invitation. Our quality invitations are the type of invite you will be proud to send. 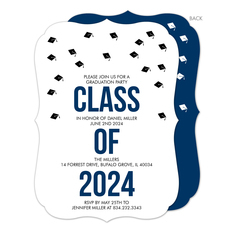 Our invitations are ideal for high school graduation parties, college graduation celebrations, and events to commemorate the completion of graduate school and advanced programs such as law school or medical school. 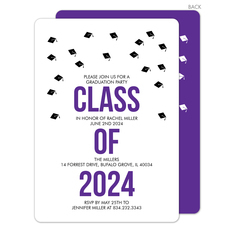 We have a wide selection featuring many school colors and themes, plus quality photo invitations, which will create the perfect canvas for your standout grad party. We know you want to go to great lengths to put together a wonderful celebration and it all starts with the right invitation. We professionally typeset each invitation and print on excellent paper stock with quality printing techniques. Each invitation is reviewed at several stages and typeset by experienced typesetters, so you can easily feel comfortable with your selection. We offer an excellent team of customer service representatives available to talk to you if you want assistance with your order. 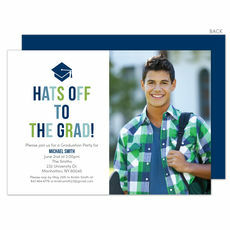 Whether you want a style with a fun confetti design, designs featuring foil-pressed accents, stylish swashes of color, more modern or more traditional styles, die-cut elements like a glittered mortar board, designs which incorporate a photo of the graduate, and on trend emoji designs, you will be able to find just the right style for a great graduation invitation. Tell the world about your accomplishments in style. We offer full color imprinting on the front and back of the invitations. 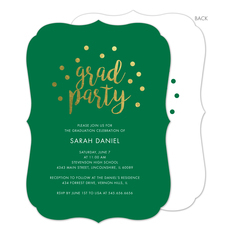 We also offer, on many styles, die-cut invitations at no extra charge, such as rounded corners, medallion shape, or scallop ruffle shapes, in addition to traditional rectangle styles. We also offer envelopes with full linings which come adhered professionally in the envelopes, along with printed return address options or printed return address labels for an excellent finished presentation. 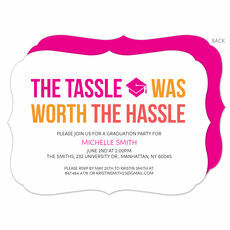 The tassle was worth the hassle so celebrate with the style. Invite those important to the graduate with pride and create a memory that will last a lifetime. It all begins with a great invite!